I was told that visiting Steveston, BC without doing the traditional ‘fish and chips’ was pretty much doing it all wrong. So, JT and I decided (albeit a tad late) to have dinner at the docks. We couldn’t get to Paijo’s because they were closing (yeah, even if it’s super sunny at 8pm, it’s still 8pm and thus some of the restaurants are closed, particularly on Sunday). We walked around the Steveston Village docks, disappointed that we might not actually get to eat fish and chips. 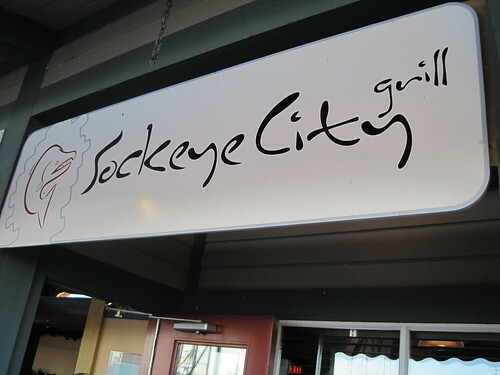 Then we came across the Sockeye City Grill. I’m glad we did. Despite having lived in England (Manchester and London, actually) I never really was a fan of fish and chips. But I love tradition. And from what I hear, fish and chips are traditional food in Steveston. The combos that we purchased from Sockeye City Grill (they have a takeout stand) were inexpensive, in my opinion. 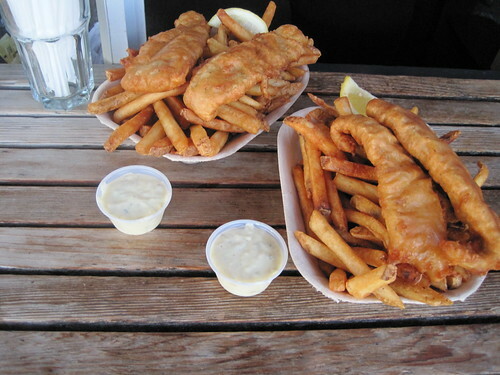 Less than $11.50 for two pieces of cod and chips, to go (plus drink, $2.00). Dinner for 2 was less than $26.00. And the fish and chips were to-die-for. I had them with vinegar (the chips) and tartar sauce (the fish). I’d definitely suggest to come visit and try it out. It’s a good alternative for fish and chips. Sockeye City is a decent alternative to Pajos – I’d also recommend Dave’s Fish & Chips on Moncton.